questions regarding your billing statement. Please be prepared to provide the registrar with your current mailing address, telephone number, and insurance information (bring your insurance cards with you). Your insurance information will be verified using our eligibility system and if you do not have your current insurance information available you will be provided a card to call our Customer Service staff within 48 hours to update your account. At the time of registration you will be asked to sign the Release of Information, Assignment of Benefits form and, if applicable, the Medicare Release form. These forms must be signed upon admission to the Emergency Room and/or a direct admission. Your physician referred you for one of these specific tests for diagnostic purposes. You will be registered at Central Scheduling/Registration in the Greer Building (see Map and Directions) and receive your test in the specific department on the first floor of the Hospital. Authorizations for any diagnostic imaging exam must be obtained from your PCP (Primary Care Physician) prior to registering for the scheduled test. Your primary care physician (PCP) will arrange for a direct admission to the hospital when it is warranted by your medical condition. Enter through the Greer Entrance (see Map and Directions) and register with the Patient Access technicians before being transported to the patient care floor. You will be scheduled for either a One-Day or Same-Day Surgery by your surgical specialist. Enter via the Main/Shea Entrance. You will be directed to the Ambulatory Care Unit (ACU) unit on the second floor of the hospital (see Map and Directions) where you will be registered and provided the opportunity to pay your co-pay for the surgical procedure. When it is warranted by your medical condition you will be admitted to a patient care floor or released to return home following the procedure. The Emergency Department doctor will contact your Primary Care Physician to discuss your condition after you have had a medical evaluation in the Emergency Department. When it is warranted by your medical condition, you will be admitted to a patient care floor. The hospital requests that you leave all personal belongings at home such as money, checkbook, credit cards, jewelry, etc. If you need to wear glasses and/or contacts bring a case for them to be held with your clothing. Please bring your insurance cards with you and your family member or friend can secure them for you during your admission. What are Living Wills and Healthcare Agents? As a patient in the hospital you will be asked by the registrar is you have a Living Will and if you have named a Healthcare Agent. This information is documented as part of your medical record and stored in Medical Records. A Living Will is a legal document that explains your choice(s) about the medical care that should be provided if you are not capable of making decisions for yourself. The Health Care Agent is someone you trust and have appointed to make medical decisions on your behalf. You are encouraged to discuss your medical condition and health care choices with your family and physician prior to a hospitalization. Living wills and healthcare agent assignment forms are available at any registration work station within the hospital or by calling the admission office at 860.456.6812. Patient Access Registrars can make a phone call to connect a hearing impaired patient with an Interpreter Service. The hospital also has multiple translators for various languages who are available to assist patients and their families. Windham Hospital is committed to maintaining clear understanding and communication regarding all healthcare issues and treatment. Following a serious and sudden medical emergency you will enter the Emergency Department (see Map and Directions) and be seen and evaluated by a nurse—a procedure known as “triage”—and registered. The triage system allows physicians to see patients based on the urgency of their medical condition. Upon discharge, patients exit through the discharge door to validate their accounts and pay their co-pay charges for the services rendered. Your physician has scheduled you for a procedure that does not generally require an overnight admission. Park at the Shea entrance (see Map and Directions) and take the Shea elevator to the second floor. Turn right and enter the Ambulatory Care Unit (ACU). 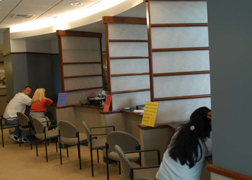 Once registered, you will proceed to the waiting room to await further instructions from the clinical staff. The hospital staff requests that you leave all personal belongings at home such as money, checkbook, credit cards, jewelry, etc. If you need to wear glasses and/or contacts bring a case for them to be held with your clothing. Please bring your insurance cards with you and your family member or friend can secure them for you during your admission. 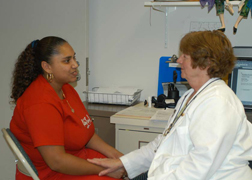 Patients who use the services of the Pain Management Department are referred by PCPs. These physicians determine a course of treatment—such as a series of steroid injections—to alleviate pain reported by the patient. You will park and enter the Hatch building (see Map and Directions) and will register prior to being seen by the pain management staff. Women who are uninsured are afforded pre-natal obstetrical services throughout their pregnancy. Services may include Lab tests and Ultrasound testing to enhance the stability of both mother and baby from conception to delivery. Department staff may also provide assistance in completing State applications for Medicaid/Husky/Charter Oak Plans.